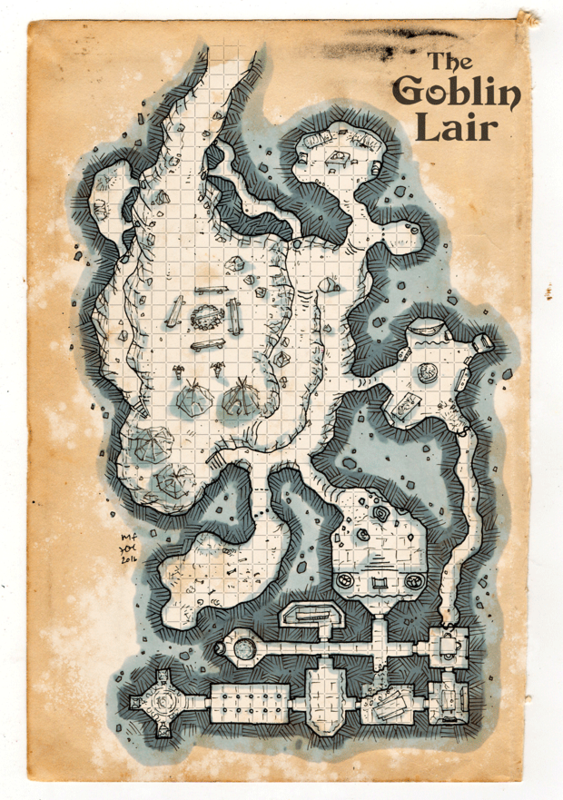 Here’s the first actual adventure map we played through with my kids in our D&D5e summer campaign (although, I have feeling that this campaign will be much longer than the notoriously short Finnish summer). The adventurers went to investigate strange thundering noises and lights coming from a narrow pass in the nearby mountains. What they found was a mostly abandoned goblin lair and strange eerie noises coming from the caverns ob the side of the mountain. As the three brave heroes (Nadar the Dragonborn Cleric, Damai the Tiefling Ranger and Reyny the Half-elf Rogue) exlored the cavers, they found out that one of the caves lead deep into old ruins inside the mountain.